Synthetic peptide within Human RDH10 aa 113-143 (internal sequence) conjugated to Keyhole Limpet Haemocyanin (KLH). The exact sequence is proprietary. NCI-H460 cells. 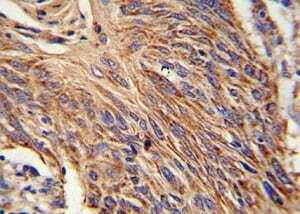 Human lung carcinoma tissue. WiDr, NCI-H460 and HepG2 cell line lysates. ab174340 is purified through a protein A column, followed by peptide affinity purification. Our Abpromise guarantee covers the use of ab174340 in the following tested applications. Retinol dehydrogenase with a clear preference for NADP. Converts all-trans-retinol to all-trans-retinal. Has no detectable activity towards 11-cis-retinol, 9-cis-retinol and 13-cis-retinol. Detected in retina, kidney, liver, small intestine, placenta, lung, heart and skeletal muscle. Immunohistochemical analysis of Formalin-fixed, Paraffin-embedded Human lung carcinoma tissue labeling RDH10 with ab174340 at 1/10 dilution followed by peroxidase-conjugated secondary antibody and DAB staining. 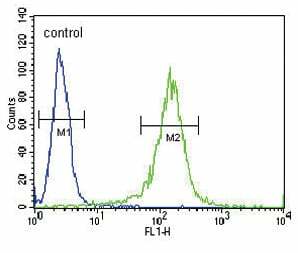 Flow Cytometric analysis of NCI-H460 cells labeling RDH10 with ab174340 at 1/10 dilution. Publishing research using ab174340? Please let us know so that we can cite the reference in this datasheet. There are currently no Customer reviews or Questions for ab174340.